This was the first middle eastern dish I ever made. It was when I began studying Judaism and when I was first discovering Islam and learning about the cultures in the middle east. For this recipe, make sure you get the Israeli-style toasted couscous. The little balls are bigger and more puffed and than the tiny traditional couscous and it looks more like tapioca. In a sauce pot, saute the onion in the oil until tender. Stir in the couscous and spices and stir until pale golden. cover with the broth and bring to a boil and cook and simmer about 10 minutes or until couscous has absorbed the liquid. Stir in the raisins and nuts. Remove from heat and let stand covered 10 minutes. Fluff with fork and season with salt and pepper. 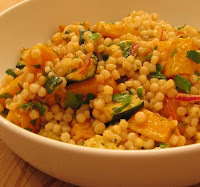 Hello, i enjoy your recipes and your knowledge and style, but i had to wonder why is it called "Israeli Couscous" when that particular meal and that particular kind of "couscous" has been a tradition in that part of the world way before the state of Israel was established? mainly by the Palestinians Syrians and the Lebanese. nettle rash are an character of Urticaria is too significant for recollective-term direction of the status. Experienced hives and rashes on your tegument. уou the usagе of? Ϲan Ι аm getting уour assοсiate link to your hοst? alsο commentіng at thіs plаcе.